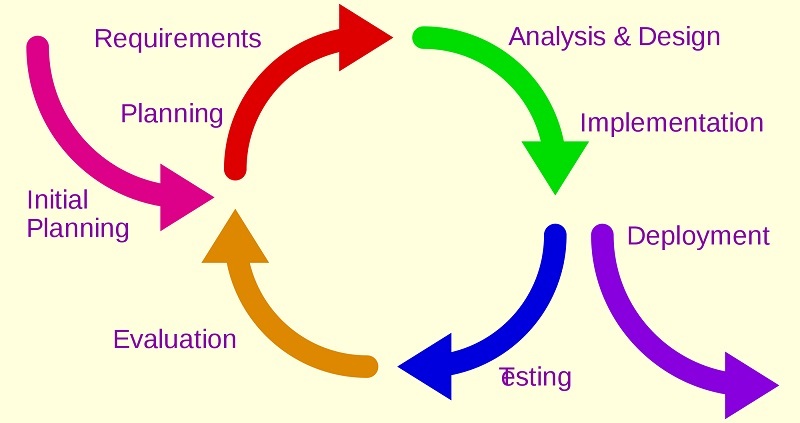 Iterative process is a research and development method whereby the desired result is reached through repeated cycles of calculated trial and error. An iterative process is not random, it is systemic. Each cycle follows a specific framework or guideline so that structural changes can be made with each cycle. This creates a gradual but steady improvement on each previous cycle which means that each new cycle is one step closer to the end goal. The difference between an iterative process and simple trial and error methods is the structural improvements. A basic trial and error process is random while an iterative process is more analytical and proceeds according to findings of each cycle. The business development department in companies often adopt an iterative process to create new business strategies or to develop new products. Consider the following example. A foodstuffs company wants to release a new ready-made pasta sauce. After the initial phase of creating new pasta sauces, the research and development team creates a focus group to taste test pasta sauce samples. With every round of taste tasting, the foodstuffs company lets the tester compare their pasta sauce with that of a competitor. The R&D team also takes notes on what the taste testers like about the product and what they would prefer to be different. Each round of taste testing follows the same structure and after each session the R&D team adjusts the recipe according to the feedback. This is an example of an iterative process. The team follows the same structure with each taste testing cycle and improves the product with the findings of each round. An iterative process is often associated with the lean business model also known as the agile business model. The lean business model strives for ultimate efficiency by reducing unproductive operations which are considered waste. Lean businesses focus on continuous improvement and constantly eliminating unnecessary stock and processes. The goal is to be as productive as possible with as little resources as possible. To achieve this, lean business use an iterative process to continuously adapt their processes and business model for increased efficiency. The figures below illustrate the difference clearly. An important difference between the two business models is that the iterative process emphasizes on experimentation and feedback before bringing a product or service to the market. This allows for less ‘waste’ being introduced to the market because the product and service has already been adjusted for consumer preferences during the experimentation phase. In contrast, the traditional business model focuses more on the sales strategy and leaves less room for product adjustments. 1. How many cycles are there in an iterative process? A. Six namely initial planning, analysis & design, implementation, testing, evaluation and deployment. B. There is no fixed number of cycles. C. The iterative process is one big cycle. 2. Consider the example of the foodstuffs company. Would it be less wasteful for the foodstuffs company to directly market the new pasta sauce product instead of performing repeated taste tests? A. Yes, directly marketing the pasta reduces time spent on research and development and so cuts costs in that department. B. No, directly marketing the product is more wasteful because there is no feedback available to show whether the product will be successful or not. C. No, directly marketing the product is more wasteful because it competes with the other products of the company that are already successful. 3. Which business model is an iterative process often associated with?